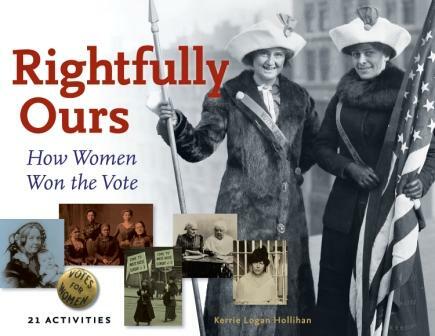 We are three months out from the centennial celebration of the Nineteenth Amendment to the U.S. Constitution. With two-thirds majorities in both House and Senate, Congress proposed it on June 4, 1919. Women’s suffrage became law of the land when Tennessee ratified on August 8, 1920. There was plenty of drama, too. In February 1919, suffragists who’d been jailed boarded the “Prison Special” to campaign by rail for their cause. Among these criminals was the elderly Louisine Havemeyer, an incredibly rich widow whose husband was a sugar baron. After he died, she devoted herself to women’s suffrage. I featured Havemeyer in Rightfully Ours: How Women Won the Vote. It’s for young readers, but as always, I wrote with adults in mind, too! Read on—and take a look at an activity from my book. It’s a cartoon—and YOU get a chance to interpret it!